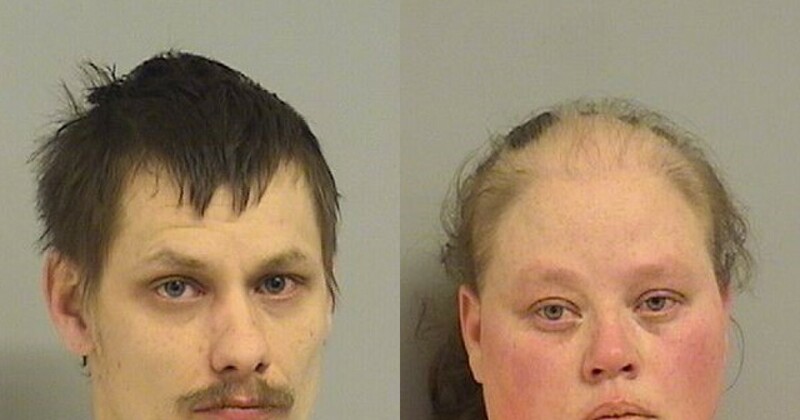 Two people were arrested on counts of child neglect and obstruction after a six-year-old boy was found in a bucket covered by a large plastic trash bag. Tulsa police said they were called by DHS to assist in the investigation into the well-being of a six-year-old child. When police arrived, the child and his guardians, Tonya Greer and Steven Adams, were not there. Police received a tip regarding the whereabouts of the two guardians, and they arrived at another residence. Police said Greer and Adams were found attempting to hide under the blankets on a bed. A boy was found nearby, in a storage bucket by the door covered with a large plastic trash bag. The boy was curled up inside the bucket, crying and appeared to be having a hard time breathing. The boy also had bruising throughout his body. The two said they hid the boy in the bucket so that officers couldn't find him. Those two look like exact opposites. What kind of bucket can a 6 yr old fit in? They do look like opposites...BUT they both look mentally challenged. Good example was hiding under blankets? Really? WTF, did they think the cops were boogie men? I wondered that, too. It said "storage" bucket so I'm thinking it could be one of those large plastic storage totes. Poor kid! Hiding under blankets? Maybe he wouldn't be seen but her, she'd be seen. The six year old: and then the police showed up and it was the best day ever !